We spent the first hour of our drive giddily bantering back and forth about our mutual disbelief. The Hubs will be embarrassed to be described as giddy, but hey, if ever a man has a right to be giddy, it’s on the day his son is born, am I right? Plus, his giddiness was guarded. It would shine through here and there before quickly disappearing. The same could be said about me. We were used to our hopes crashing as rapidly as they had risen in this adoption world. But, this was different. We knew it was different. There were quite a few emotions keeping us company in that car. The first was elation, obviously. The second was terror, since by now our minds were set to Doom Mode: Code Red whenever it looked like something was going to go our way regarding family planning. The terror began to recede ever so slowly as we received texts periodically from our coordinator, updating us on the situation. The birth parents have signed the papers. They are eager to leave and want to make sure you are all in and aren’t going to change your mind. How much longer until you arrive? Finally, with about a half hour to go, we allowed ourselves to feel that this was it. We didn’t say what we both were thinking until days later; the reason we had experienced so much heartbreak in this process was because we were meant to be right where we were, on that very day, headed north on I5 to meet our son. I was a real peach to be trapped in a car with until we finally cleared that last bridge, amen and hallelujah! From there it was only a couple miles to the hospital, a small brick facility in the center of town. As we drove, we passed the Applebee’s where we had met our first expectant mother after she “chose” us to adopt her baby. Yes, it’s true; fate had called us back to the very same small town and right by the same stupid Applebee’s where a duplicitous young lady had taken us on a wild, painful ride a few months earlier that taught us that adoption is, above all other things, an unpredictable industry where people are not always as they appear to be. As we drove by, we did what all mature, sophisticated parents would do on their way to meet their newborn son: we both flipped the bird at Applebee’s and laughed hysterically as we did it. I’d say it had been a good twenty years or so since I had partaken of any bird-flipping. Hey Applebee’s, it’s nothing personal. You guys make the best French Onion soup and I would never disrespect you with hand gestures unless I had a really solid reason. You understand. Finding the hospital and parking was blessedly easy. Navigating to the seventh floor was not. It was one of those deals where you take the elevator to the third floor, (as high as that elevator goes) then walk a hundred miles to find the elevator that will take you to the fifth floor. The next one might get you to the top if you’re nice to it. All very complicated for a small hospital, but likely exacerbated by my at-capacity bladder. The Hubs and I were both wild-eyed, looking for maps or signs and wondering how to reach the seventh floor and our baby boy. A nurse saw us and came to help. That’s one of the benefits of smaller hospitals, I truly believe. She had nothing to do with the labor and delivery floor, but she came on over and gave us step by step directions how to get there. It was the first of many acts of kindness we were shown during our stay. Upon reaching the hallowed seventh floor, we were greeted by our adoption coordinator. She needed to debrief us on additional information prior to taking us to our baby. Bathroom breaks had to occur first so that the Hubs and I could focus on the paperwork and not our bladders. Finally, we sat on a bench right outside the door of the nursery. We couldn’t see in but we could hear excited nurses and hushed voices. Our coordinator mentioned there were only two babies on the whole floor right now. It had been a slow day for births. She informed us that the nurses were bursting with joy that an adoptive family had come for the baby. Apparently, at this particular hospital many babies are born addicted to heroin and are taken by social services as soon as they are discharged. I imagine it must be heartbreaking as a nurse to see babies born every day that are headed directly to the foster care system. Granted, the mothers of addicted babies also have a right to make an adoption plan and place their baby with a family. However, almost all choose to try to beat their addiction and reclaim custody of their babies, eventually. Sometimes they win and sometimes the addiction wins. This is the reality these amazing nurses deal with every day, working in a little hospital in a little town that was overthrown by heroin and other drugs during the recession. Once drugs get a hold of a town right off the freeway, it’s hard to get it back. And that is why when we finished our paperwork, we entered the nursery and were immediately greeted by EIGHT overjoyed and teary-eyed nurses. Two babies on the whole floor that night. Eight nurses. 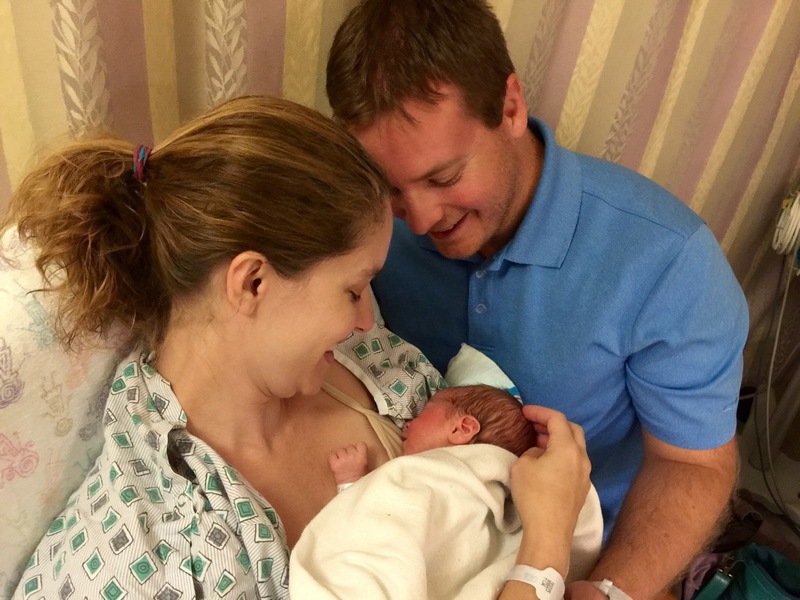 We learned the backstory later: at our son’s birth, neither birth parent chose to hold him or see him. It was too hard, knowing what came next. He was not born exposed or addicted, he was healthy as could be and desperately needed what all newborns need: to be held. So each of these nurses took shifts all day long, rocking our baby boy and doing kangaroo care nonstop, as he waited for his mama and dada to arrive. They did this for 15 hours, after their paid shifts were over and they could have gone home. 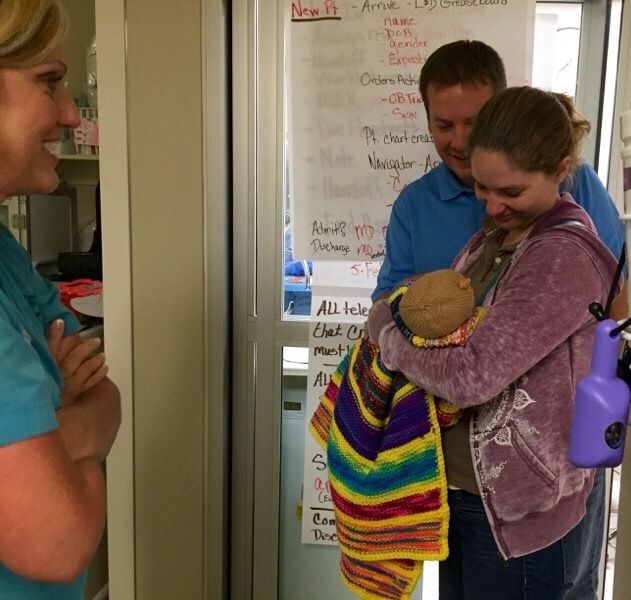 When they learned we were close to arriving, they dressed him in an adorable preemie outfit they had to work hard to find, and wrapped him in the nicest blanket they had, knitted by a hospital volunteer. Then they stayed to greet us and witness the moment this little 5lb 5oz baby was placed in the arms of two parents who wanted him so very much. The nurse holding our son walked slowly towards us and gently transferred him over to me with the Hubs standing as close as possible, arm around me, without actually standing on top of me. I stared in awe at the little face peering up at me, his eyes wide open and strangely alert for a newborn. And that’s what I continued to do. I stared, taking in every detail of his face, his fuzzy duckling hair sticking up, the layer of light colored baby fur covering most of his body. I gazed into those precious blue eyes until my eyes swam and my vision blurred. The moment stood still, perfectly still, as I held this furry little creature that was always destined to be our son in my arms. 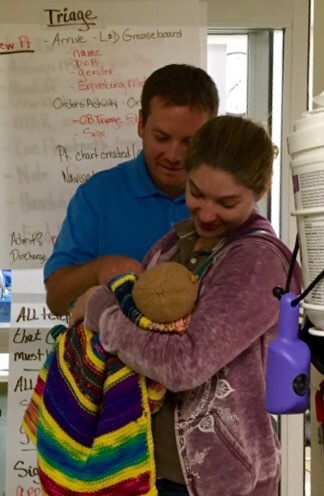 I was aware of the presence of others in the room and the Hubs holding me as I held our son, but just barely. I could hear nurses sniffling and camera shutters clicking but nothing could truly break through the moment. Moments like this are rare, I’m told, and in my experience it is true. You know it when it happens to you, because it is like no other feeling on earth. It is something that is branded onto your heart and soul and is almost impossible to adequately put into words. Here are a few pictures that might show the magnitude of this moment better than I could hope to describe it! Chapter Three is on the way! Don’t forget to read Chapter One of you haven’t already. If you enjoy reading this blog, I hope you will choose one of the many ways to follow it and become part of the group! Scroll down for ways to follow. Please join my BG FB page as well. I love the sense of community my followers share, and all are welcome! Thank you so much! I really appreciate that. It was such a special moment, I don’t think I even did it justice in the post. It was just perfect. I could not be happier for this beautiful family. Who is luckier – these two little boys or the mom and dad? All are very blessed. This made me smile so big my face hurt! Thank you! Awww this is so wonderful! I couldn’t be happier for you! Can’t wait for part 3! I’m so excited for you! Isn’t it surreal how all of the heartache seems … I don’t know, almost instantly meaningful? That’s not the word I’m looking for but my brain fails me … Anyway When you get that baby and realize that *this* is the one you were meant to get, and you appreciate it on such a different level because of all you went through to get there … Congratulations again! Yes! That’s exactly how I feel. There is a sort of beauty to all the pain we experienced. It’s hard to describe, but I do get it! Oh my goodness I am a crying mess! I was holding my breath on your drive, and did not realize it until I saw the picture of you holding your sweet baby. I am so thrilled for your family! Thank you so much! That pretty much sums up how it felt to be on that drive!